The Remeda shelf rack and transfer platform is used together with a trolley or an automatic loader to carry the goods through the sterilizers. They allows goods to be pre-loaded at the packing table and is manufactured in stainless steel, where baskets, containers or packs can be placed. 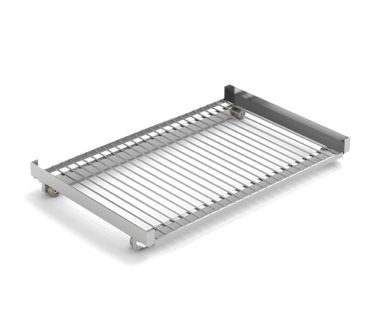 The shelf rack and the transfer platform is used in a circulating flow, and is returned to the clean, loading side after the sterilization process. 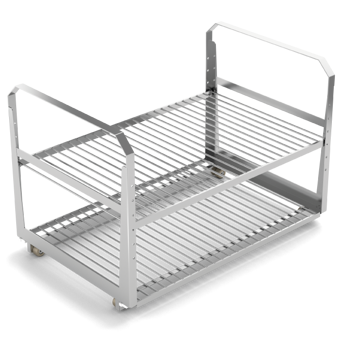 The Remeda shelf rack with wheels is developed to fit the Remeda loading trolleys. They are used together with Remeda's loading trolleys. The Remeda shelf rack is developed to fit the Remeda automatic basket loaders. They can also be used together with the Remeda transport trolleys. The Remeda transfer platform with wheels is developed to fit the Remeda loading trolleys. It is used together with the Remeda loading trolleys. The Remeda transfer platform is developed to fit the Remeda automatic basket loaders. They can also be used together with the Remeda transport trolleys.